1 x 1 litre Weck Juice Carafe Wine Jar. 1 litre (exact capacity 1062ml) Weck Juice Bottle. Takes Small lid and seal. Choose either the option of purchasing the jar only or the jar complete with glass lid, natural rubber seal and 2 stainless steel clips. Weck reusable Glass Jars are of the highest quality and contain NO BPA (Bisphenol A). These jars are suitable for water bath canning. A fabulous way to present freshly squeezed juice, smoothies or wine. With a glass lid there is no risk of corrosion or contamination from the lid. 1/2 litre (actual capacity 530ml) Weck Juice Bottle. Takes Small lid and seal.Choose either the option of purchasing the jar only or the jar compl..
290ml / 1/4 litre Weck Juice Bottle. Takes Small lid and seal. Choose either the option of purchasing the jar only or the jar complete .. Perfect for parties, home entertaining or as gifts, this Ball® mason jar glassware is made in the USA with the same high quality glass as Ball® cannin..
4 x Ball Collection Elite Blue Jars - Wide Mouth Pint. By popular demand! Due to the overwhelming popularity of the heritage blue pints released in 2013, Ball has now expanded its product line to include b.. Preserve your food the natural way with the Weck Fermenting Jar. Fermenting food is the oldest form of preserving with the technique being in use for .. These weights are actually Weck reusable Glass Lids. 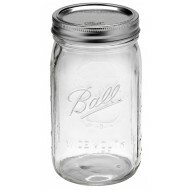 Made of the highest quality glass, they contain NO BPA! (Bisphenol A), lead,.. The new Weck Deli jars are not shaped like a conventional jar. Instead they have a wasp waist which makes them perfect to hold in your hand. 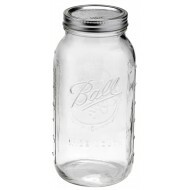 &nb..
1/2 litre / 500ml Weck Preserving Cylinder Jar. Takes Small lid and seal.Choose either the option of purchasing the jar only or the jar complete w..
140ml Weck Mini Mold Tapered Jar - 761 - SingleWeck reusable Glass Jars are of the highest quality and contain NO BPA (Bisphenol A).These jars..